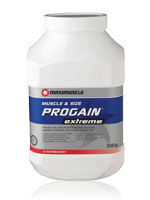 Buy 2 Progain Extreme for 65,00EUR each! Buy 3 Progain Extreme for 60,00EUR each! Maximuscle’s Progain Extreme is the next generation of weight gainers and has been designed to deliver the most rapid gains in muscle mass and strength possible with a weight gainer. 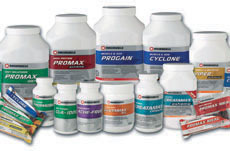 It contains ingredients and a formula based on the latest research into muscle growth and weight gain. Progain Extreme contains a massive 3g of free form and bound Leucine, which could be the most important amino acid when it comes to triggering new muscle growth. You'll also find 3g of MaxPure™ Creatine in every serving. If that wasn't enough, Progain Extreme also contains 3g of total Glutamine peptides, which is well absorbed by the body. Each serving of Maximuscle’s Progain Extreme contains an easy-to-digest 508 calories per serving and high amounts of whey protein giving you a whopping 41 grams of protein per serving. The weight gain supplement makes it easier than ever for hard gainers to get the calories and protein they need to support muscle growth. Take 1-2 servings of Progain Extreme every day in conjunction with your weight-training programme and you’ll soon experience the muscle and size gains you’ve been searching for. Mix 2 scoops (125g) of Maximuscle Progain® Extreme with 500ml of water. Stir with a fork for around 10 seconds or mix in a Maximuscle shaker and drink within 5 minutes. Progain Extreme is best when mixed with water, not milk or fruit juice.